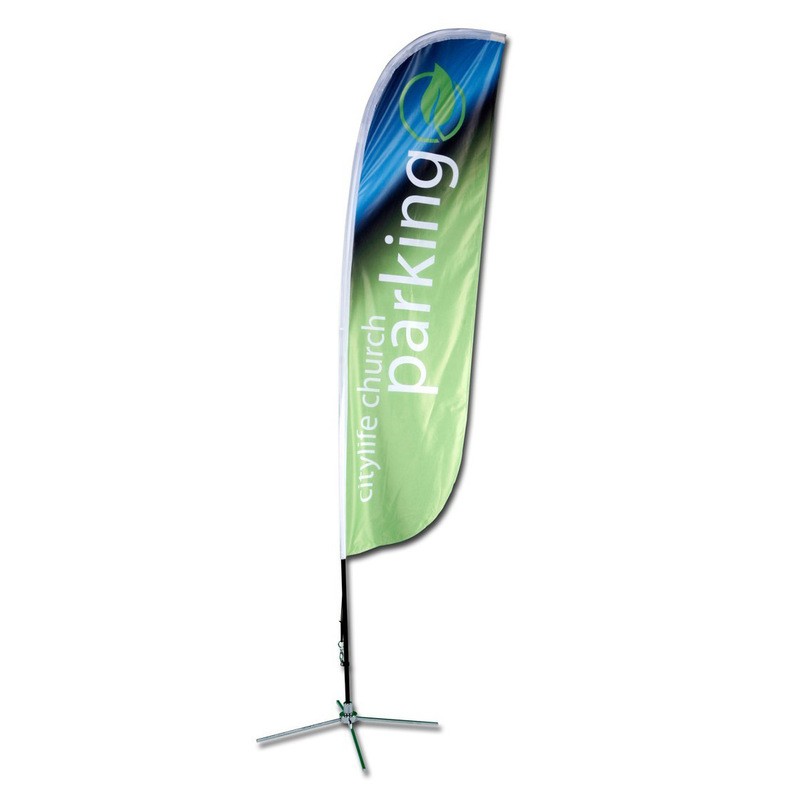 Our flags feature a modern flying design that will be sure to attract attention for any event. We print our flags digitally and dye sublimate so you are able to have as many colors or graphics in your design as you would like. Images on single-sided flags will appear in reverse on the backside. If you need your image to appear the same on each side you will want to order a double-sided flag. This display will withstand moderate winds and weather and can be set up in just a few minutes. Every flag comes with a carrying bag that will fit the flag and stand neatly inside. There are two main types of bases available: Ground Spike or X-Base. The X-Base sits on flat surfaces indoors or out and can be weighted with a water bag. Ground Spikes are designed so they can be driven into dirt or grass. A third base for indoor use only is also available called the “Indoor Flat Base”. This base is better to use indoors over the X base because it is less of a tripping hazard. Be sure to not keep your flags outdoors in heavy winds or bad weather as this will shorten the life of your print and stand. Flags that are used in fair weather conditions are expected to last up to a year.